At the same time that individuals across the US and EU offer support to victims of famine and conflict in Africa, their countries’ energy policies and development agendas take food and other resources away from Africans–while also harming the environment. Take a moment to read the FAQs on How Land Grabs Contribute to Hunger and Conflict. Research released today by the Oakland Institute demonstrates that land grabs–largely unregulated land deals involving foreign corporations and speculators–continue to be promoted as a “development” solution for African nations. Development agencies including USAID and the World Bank Group are often the architects of these deals that promise benefits for Africans but fail to deliver. Furthermore, the research shows that US and EU energy policies that tout the benefits of agrofuels and carbon credits–key elements of these land deals–are actually making climate change a bigger problem. 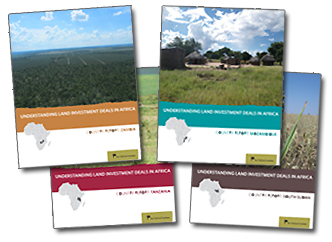 Reports and briefs from the Oakland Institute’s first phase of research are available at the Understanding Land Investment Deals in Africa overview page.